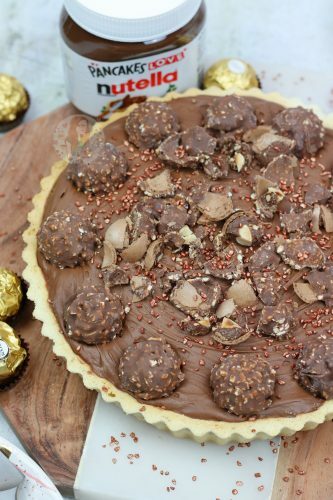 Ferrero Rocher & Nutella Tart! 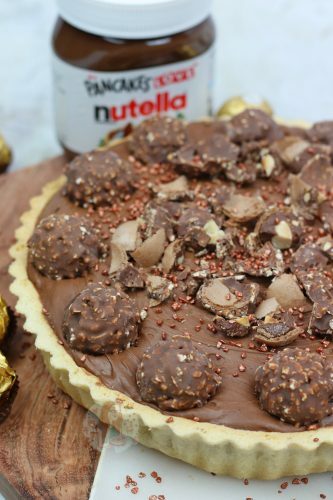 A Sweet Shortcrust Pastry Base, with a Layer of Nutella, and a Chocolate Nutella Mousse Filling with Ferrero Rocher – a Delicious Nutella Tart! So Nutella is one of the dreamiest things. Like, as many millions of people will agree, its DELICIOUS! 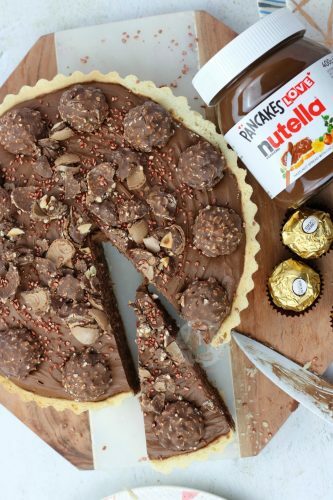 Making it into all sorts of things makes all other sorts of delicious Nutella treats such as this delicious tart. My Nutella Rocky Road has been a hit since I posted it recently, along with my other recipes such as my Nutella Cupcakes and Ferrero Rocher & Nutella No-Bake Cheesecake. They all show that Nutella is a hit, and I can’t resist having another delicious treat to go along with them. I have always thought that Ferrero Rocher are such a delectable treat – they’re so crunchy, nutty, and chocolatey! Which basically means they are perfection. I have always wanted to make a dessert that involves them as they have always been one of my favourite chocolates, and I figured that a delicious and mousse like chocolate tart would be perfect! The Nutella layer at the bottom of the tart is a nice surprise to those eating the dessert as you can’t see it from the top, and its so full of flavour! This in addition to the beautifully light and and delicious chocolate tart filling is the perfect combo! This is without a doubt one of the most amazing desserts I have made – and its so simple! Its a recipe that can be altered quite easily to suit what people prefer, but if you follow this recipe well, you will have a winner! I have made this dessert for Christmas Eve dinner, Christmas Day lunch, Birthdays, Mother’s Day, and so many more occasions I can’t even count – it is PERFECT for any occasion!! Recipe Updated February 2018! – nothing was changed in the recipe, other than just making it again and devouring it and updating the pictures involved. This one is always a good show for anyone who adores Nutella, or Ferrero Rocher, but can easily be altered to others tastes! 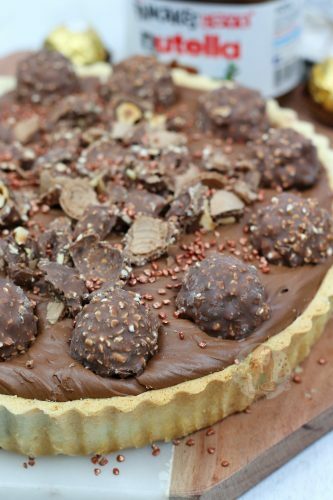 If you want to try something similar, why not try my Rolo Tart, or Biscoff Tart?! 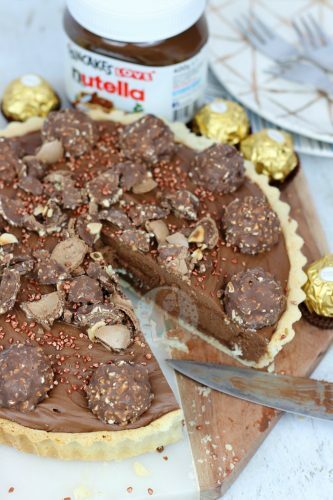 A Sweet Shortcrust Pastry Base, with a Layer of Nutella, and a Chocolate Nutella Mousse Filling with Ferrero Rocher! Sift the Flour and Icing sugar, and add the Diced Butter, Egg Yolk, and 1tbsp of cold water into a food processor. Blitz quickly on the pulse setting until the mixture starts to bind, it shouldn't take too long at all! Grease & flour a 23cm Tart Tin - Roll the pastry mix out onto a lightly floured surface to the thickness of 1-2 coin(s). Press the pastry into the tin and trim & neaten the edges. Fill any gaps of the pastry with any excess pastry so its all covered! Refrigerate for 1/2 an hour! Preheat the oven to 200C/180CFan - Cover the pastry with baking parchment and fill with baking beans/rice and bake the pastry Blind for 15 minutes remove the parchment and the beans and bake for an extra 5 minutes or until the pastry is cooked through and turning golden! Melt the two types of Chocolate slowly over a bain-marie or in the microwave in 30 second bursts - giving it a stir each time. Leave this too cool whilst you do the rest. Spread 200g of the Nutella onto the cooled Pastry Base and leave for now. In a separate bowl, pour in the Double Cream, Vanilla, Icing Sugar and the other 200g of Nutella - Using an electric whisk (or you can do it buy hand if you're brave!) whisk until the mixture is holding itself and has formed peaks. Once that is done, you can pour in the melted Chocolate and fold it together with a spatula until the mix is well combined. Pour this on top of the Nutella mix and spread evenly. 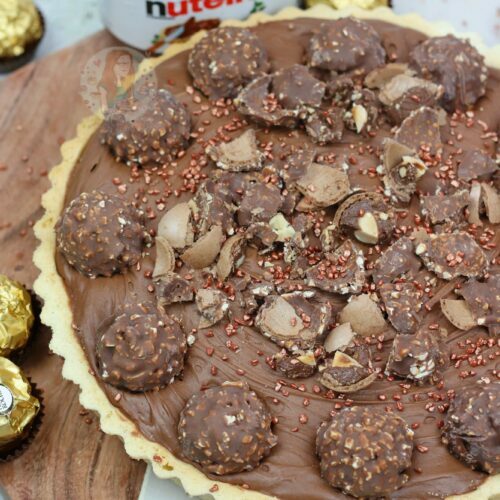 Press into the mixture 12 Ferrero Rocher (one per slice), and chop any extra over the Tart for decoration! Leave to set in the fridge for 3-4 hours or longer if needed. This recipe will last for 3 Days in the Fridge! 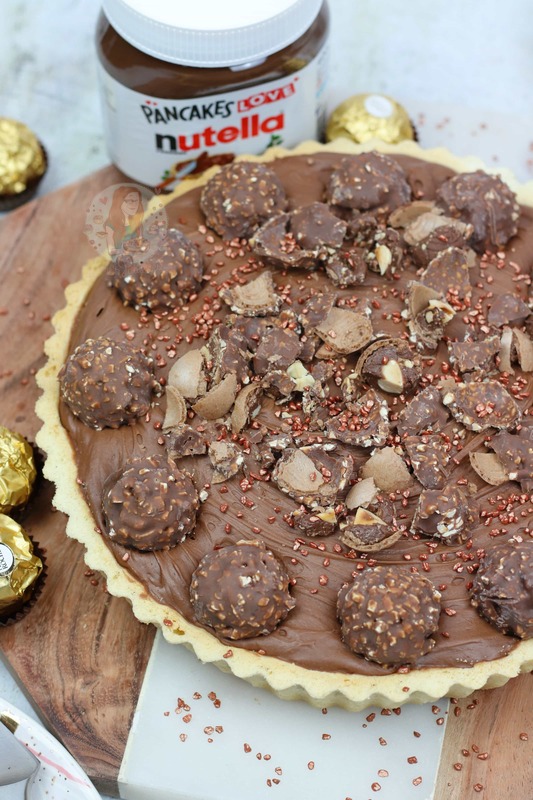 Using Ferrero Rocher are optional, but they are delicious! You can easily use Kinder Bueno instead if you wanted something cheaper! You can easily use a no-bake biscuit base instead if you wished by blitzing 300g of Digestives into a crumb, and mixing in 150g of melted butter. 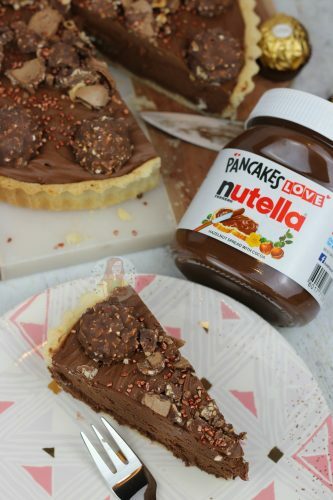 Find my other Nutella Recipes on my Recipes Page! Older Next post: Gingerbread Cake! – Happy Mother's Day! Newer Previous post: Baileys Truffles – St Patricks Day Recipe! I’ve got a 25cm tart tin, do I need to adjust the quantities of the mixture etc and if so how much by? Yes it can you just need to make sure its evenly distributed. And cool it before pressing into the tin for a bit as well as doing by hand tends to warm the butter up too much. It lasts for 3 days in the fridge. This looks so amazing! I need to try this! Your blog is lovely, could become one of my new favourites! This looks amazing. Would you please advise what is the size of this tray in the recipe? Ohmiword!!!!! Your recipes look evil….in a purely chocolaty good kind of way ?…. Thanks for the visit and the like. I know i shall be back for more of yours!! Awwh thank you so much! I loved your post!! I just had to post this gorgeous creation of Jane’s – Read it and weep, friends! And by the way, her blog is a wealth of such stuff, so head over there and subscribe. I love how decadent this dessert looks! Can’t wait to try it! Another one to definitely try! Mmm, Nutella! How much is a splash of milk? Reviewing ingredients to make this ??! As annoying as it sounds, enough to make the dough the right texture! Sometimes it can take none, or quite a bit depending on the flour ☺️ I add the egg, then add a few drops of milk till it gets to the right consistency you normally find it shortcrust pastry! Ahh doo it! It’ll be perfect for the job! Not overly keen on Ferrero Rocher, but have to say that looks amazing! Thank you! You could easily substitute it for other chocolates that you do like! Love Ferrero Rochers too. My favourites! The photo alone is a torture ?? Awwwh haha I tried my best with the photos, took so many attempts! But thanks! Try the recipe yourself, you won’t regret it!! I will! I was trying to think of an impressive cake for my husband for his birthday. Think this will be it! Awwh YAY haha that makes me so happy, I really hope he likes it!! Well if he doesn’t, no problem! More for me hahahaha! Mmmmm Ferrero rocher. It reminds me of my childhood!!! Love those! And your tart looks scrumptious! Thank you so much!!! I love them too!